Hey hey everyone and hope you’re enjoying this spectacular season. 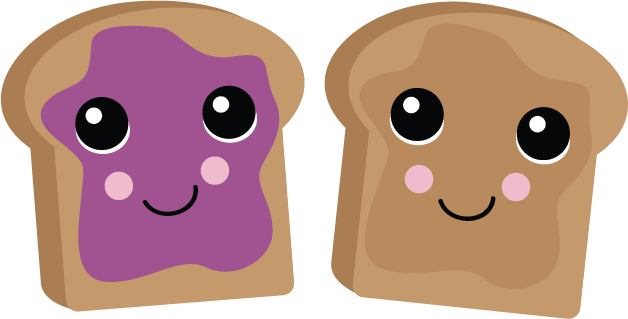 Peanut butter and jelly sandwiches. So simple but oh so good. Breakfast of champions for this Mama. Home Fires, a newer Masterpiece show on PBS. Why do I like British shows so much better than American ones? No idea, except the fact that a majority of American ones are crap anymore. Personal opinion. Yarn. Cooler weather seems to make me want to knit or crochet lots more. Right now I’m experimenting with an asymmetric poncho design. Last month in my “What I’m Into” post I mentioned our school fundraiser and the Candy Land theme. Well folks, it happened last week and it was a blast! 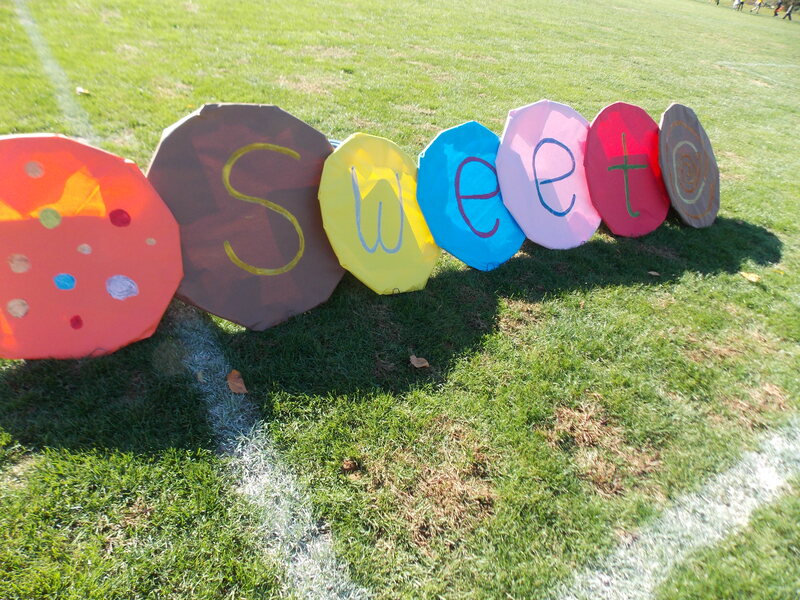 This is a pic of one of our decorated areas–hula hoops covered in paper and glittered letters spelling out the word SWEET. Now I can breathe a sigh of relief that it’s over except for a few post-Race things to wrap up. Beautiful fall sunrises and sunsets. I snapped this picture last week one morning. That is an Amish neighbor’s farm in the background. I haven’t went out to snap any leaf shots, but this past week they have gotten super beautiful in our area! My crew at an orchard. 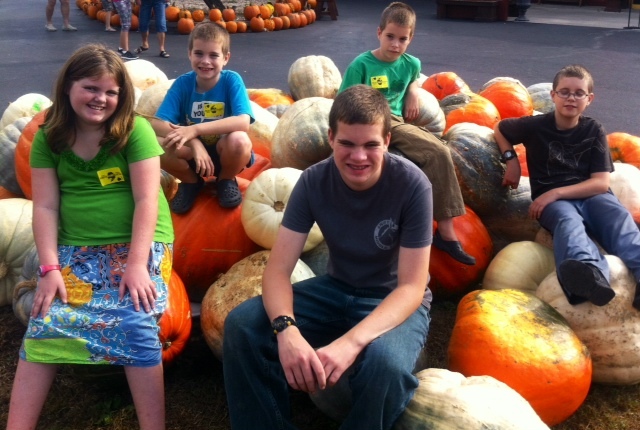 I loved this big pumpkin pile. Speaking of pumpkins, I’ve been really into making roasted pumpkin seeds. Such a great little snack. Precious moments. These two had no idea I took this picture until after the fact! I heard my 10 and 12 year old kids in my bedroom one Sunday morning chattering among themselves. 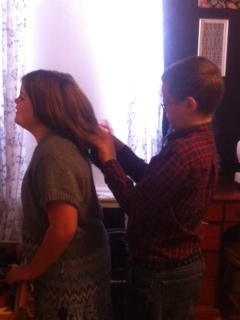 Here my son was helping his sister brush her hair. Way too sweet! Well, that’s it for now and thanks for checking in! 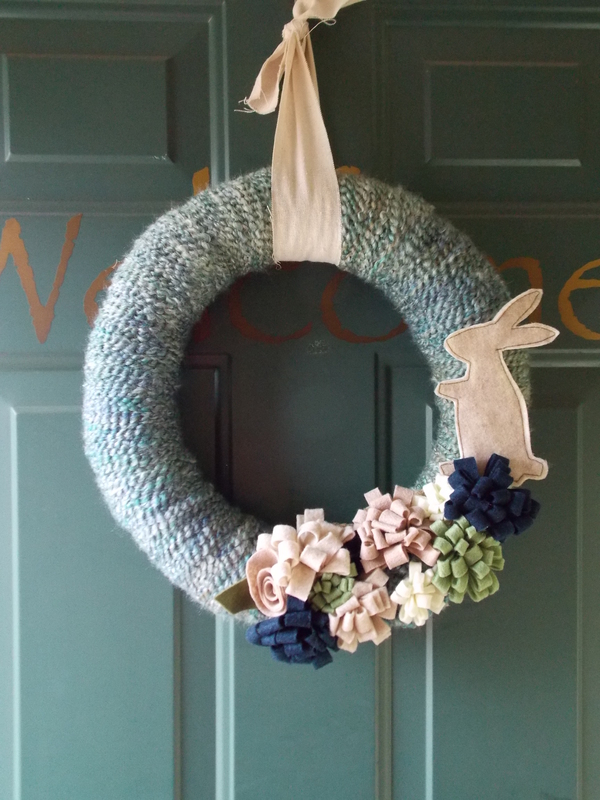 To help usher in Spring, I made a new wreath, this one wrapped in homespun yarn. I was really fond of the blue and green color palette of this yarn, as well as the nice fuzzy texture. 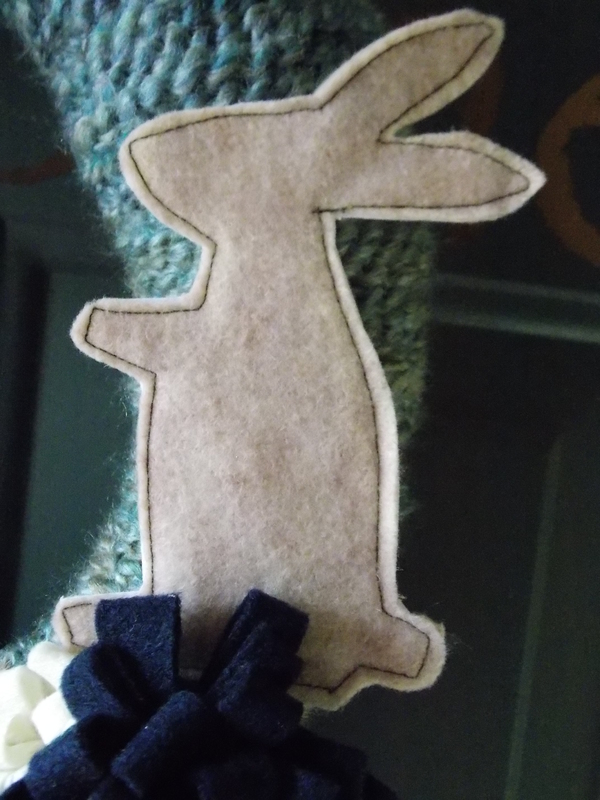 To make this not just a Spring wreath, but an Easter wreath, I added this sweet little felt bunny that I made and stitched together. I added a layer of stiff interfacing in between two layers of felt to help give it structure. 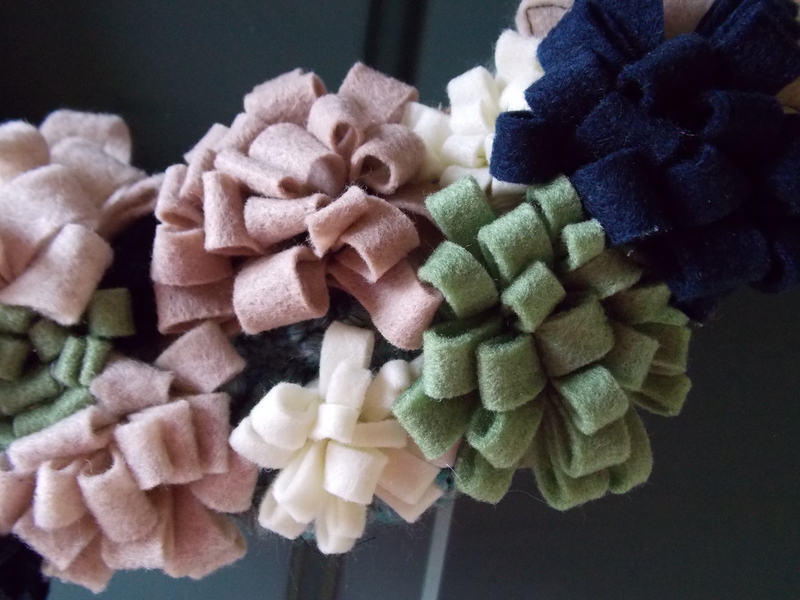 I also made up a bunch of these felt flowers in light neutrals, along with a navy blue and one shade of green for pops of color. Since a lot of people often decorate for Christmas right after Thanksgiving, I thought it would be timely to share a Christmas wreath idea today. This one is a heart-shaped foam wreath form wrapped with a red yarn and embellished with white felt roses. I also used a little green felt to make leaves for the roses. 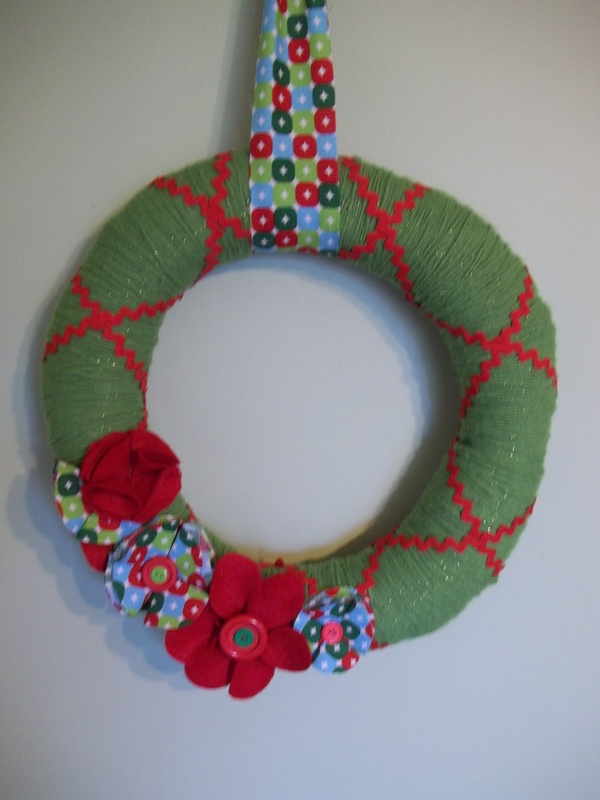 A green with red grosgrain ribbon was used as the hanger. Very simple and not a lot of bells and whistles, but sometimes simplest is best. While I have made my share of yarn-wrapped wreaths, doing a heart shape was new for me. The result is pretty, but I have to admit that wrapping it was much more awkward than doing a basic circle wreath, especially when it comes to the center point areas. It definitely took a lot of yarn to make sure those areas were well covered. Actually, if you just switch out the ribbon, this would make a great Valentine’s Day wreath as well! 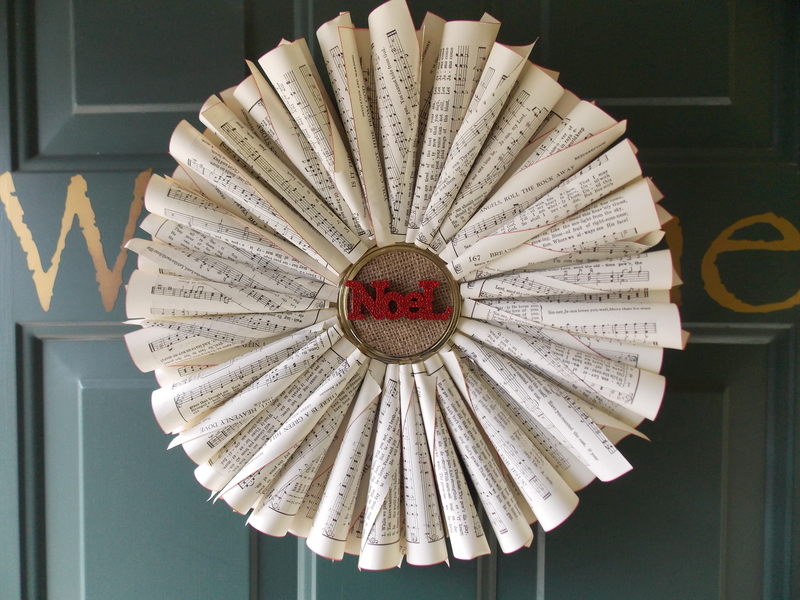 Book Page wreath, this one made out of old sheet music. 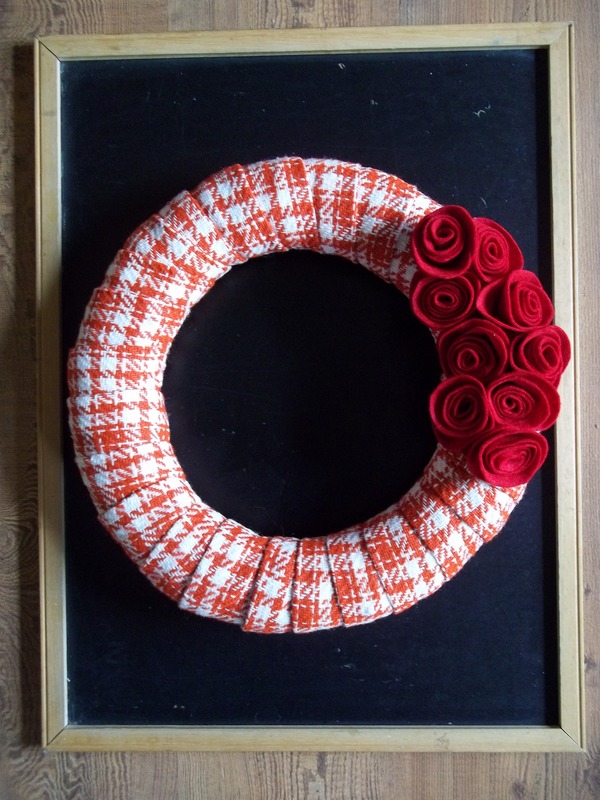 Red Hot Wreath, wrapped in vintage fabric. 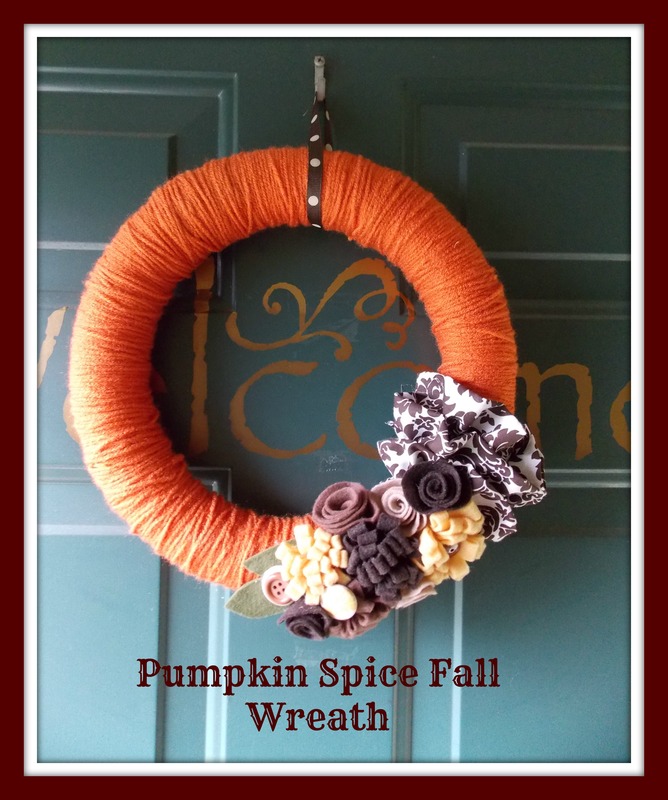 Can you tell I love making wreaths? Oh yes I do. Hope you count your blessings tomorrow and have a wonderful Thanksgiving!! Today I am starting a little series in preparation for Christmas. Last year I did series of posts with ideas for a handmade Christmas and this year I am doing the same thing with some fresh new ideas for you all. My first idea in this year’s series is pretty cheap to make, and you can make a bunch of them at one time. Plus I think they’re just a little cute to boot. They would be perfect for any little girls in your life as a stocking stuffer or a few different ones packaged together as a gift. 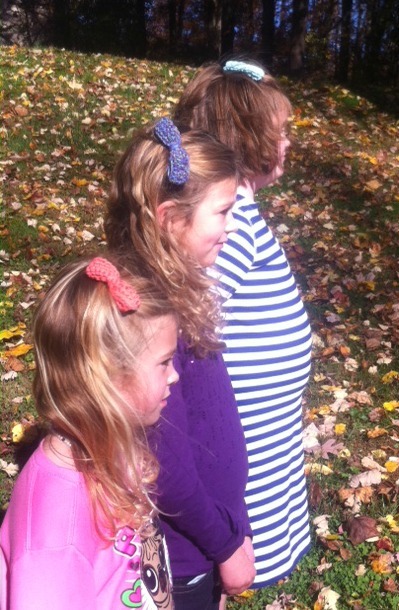 I took these pics yesterday when we were babysitting my nieces, so I had 3 pretty little models to show off these bows. 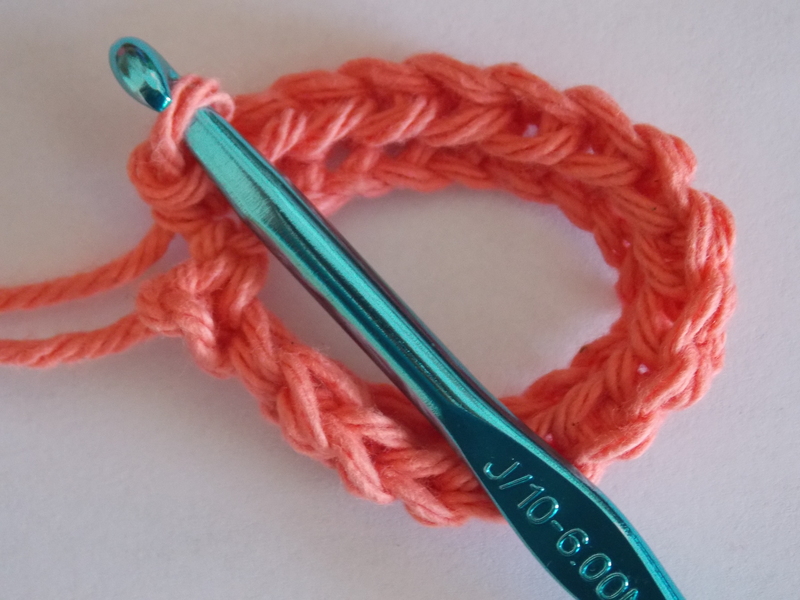 Select a crochet hook and yarn. 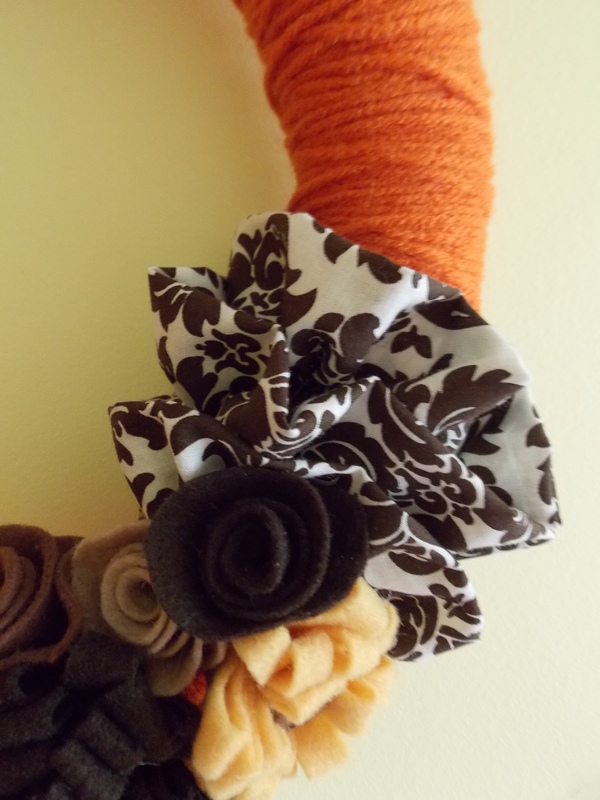 I used a “J” hook for most of my bows and preferred the cotton yarn, which can be bought for around $2 a ball. One ball of yarn would make a ton of these. 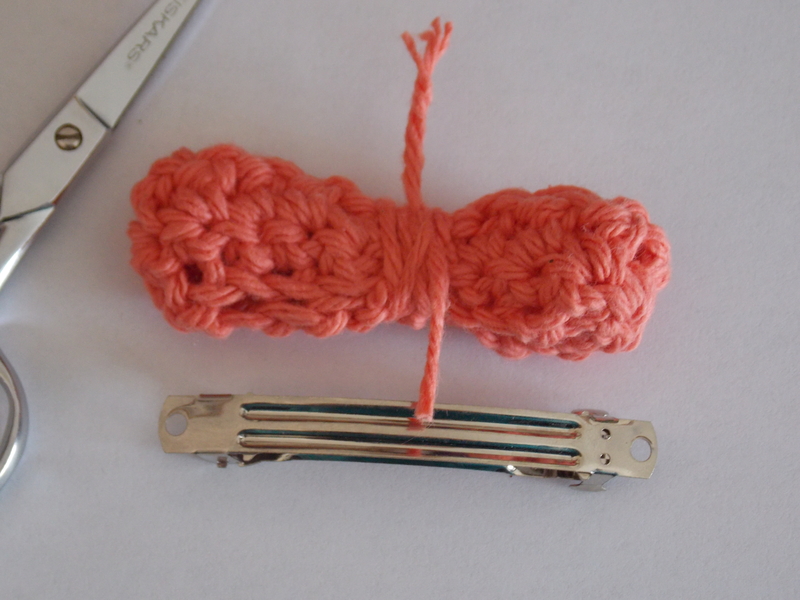 Make a slip knot and chain stitch about 25, leaving a 2″ tail. 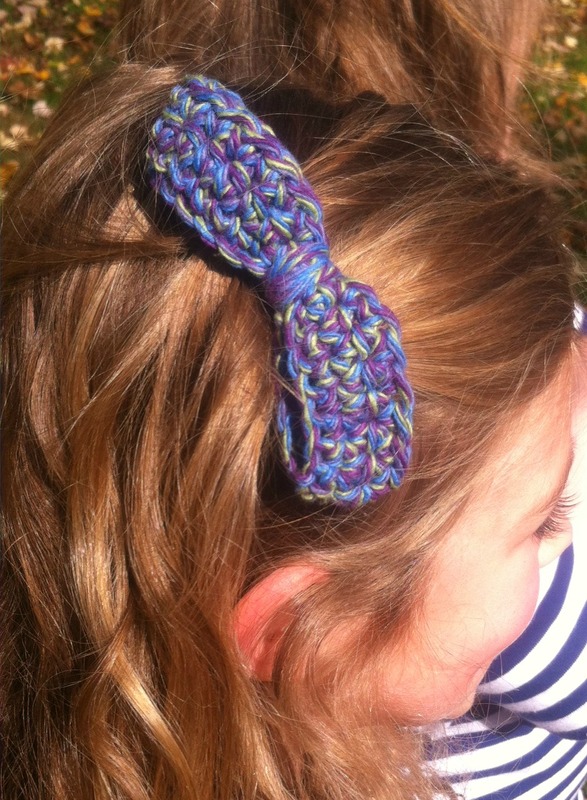 You can go smaller than that if you wish, or chain 30-40 if you are going for a bigger bow (like the purple-y twisted yarn one pictured above). Once you get to that number, slip stitch into the first stitch you made to make a circle. Continue around the circle again using whatever stitch you feel like. 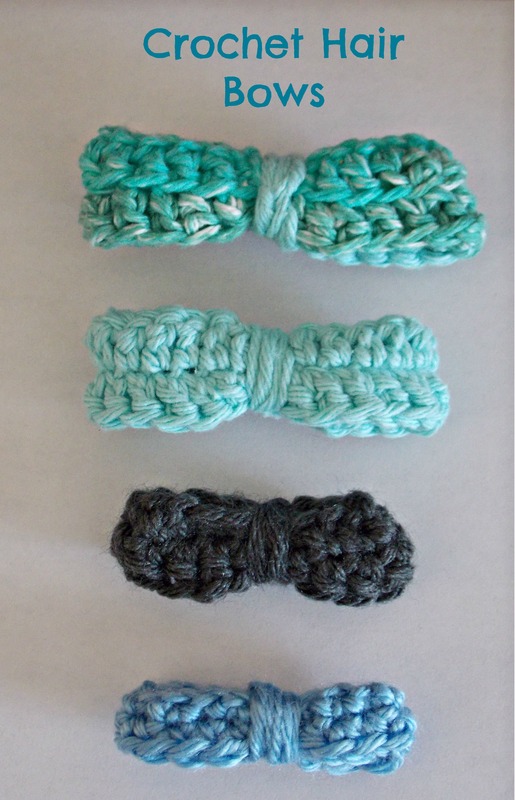 For some I just did a single crochet several times around, or mixed it up with a double or half-double. Make at least 2-3 rounds, depending on how thick you want the bow to be. 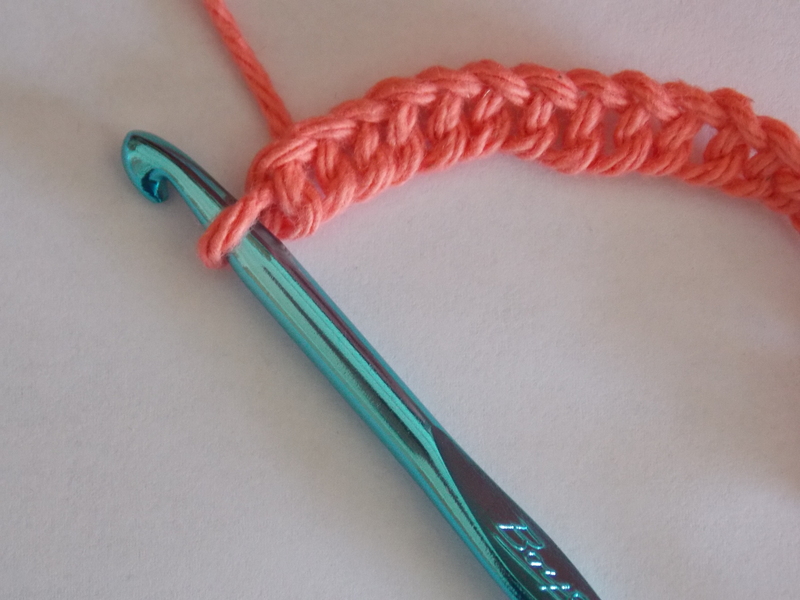 Once you’ve gotten in enough rounds, cut off yarn, leaving another tail @6-8″ long. Slide it through that last stitch and pull tight. Now wrap it right around the “middle” of the bow a few times and tie tight with the tail you left hanging at the beginning. 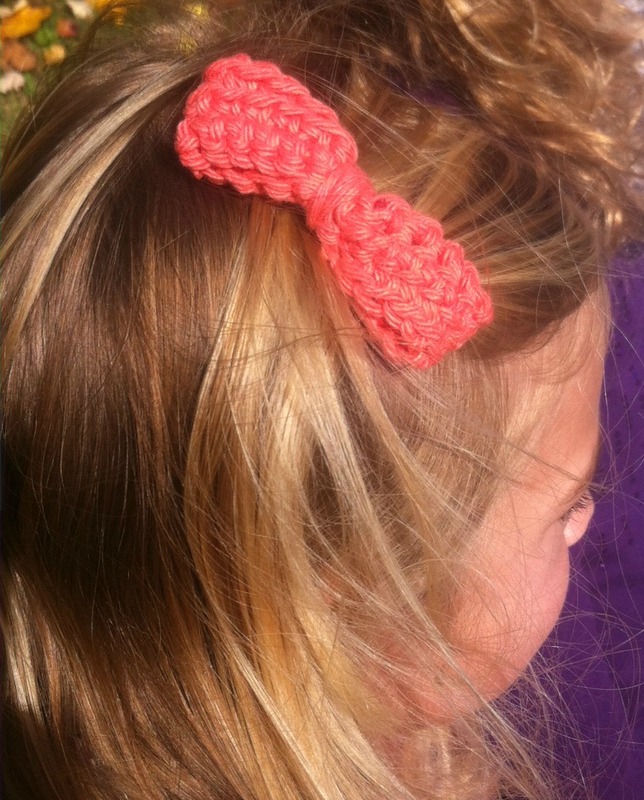 Trim and hot glue to a barrette back. Well, that’s it for now. I have some more ideas up my sleeve to show you in the coming weeks. If this post looks familiar, it’s because it is a repeat of one I did at this time last year. 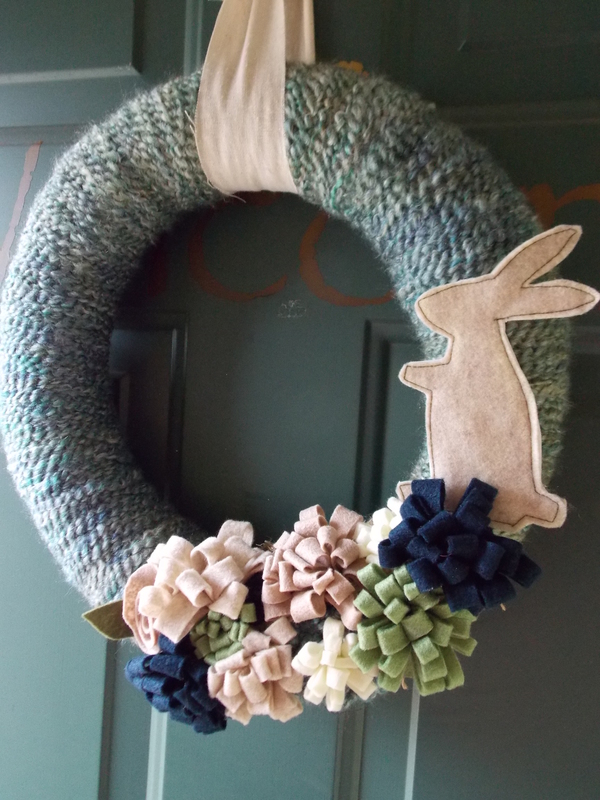 Yep, this little wreath made a bit of a splash in the cyber world, and I was very humbled by the response that it got. It is by far one of my most highly viewed projects and one of my personal faves. 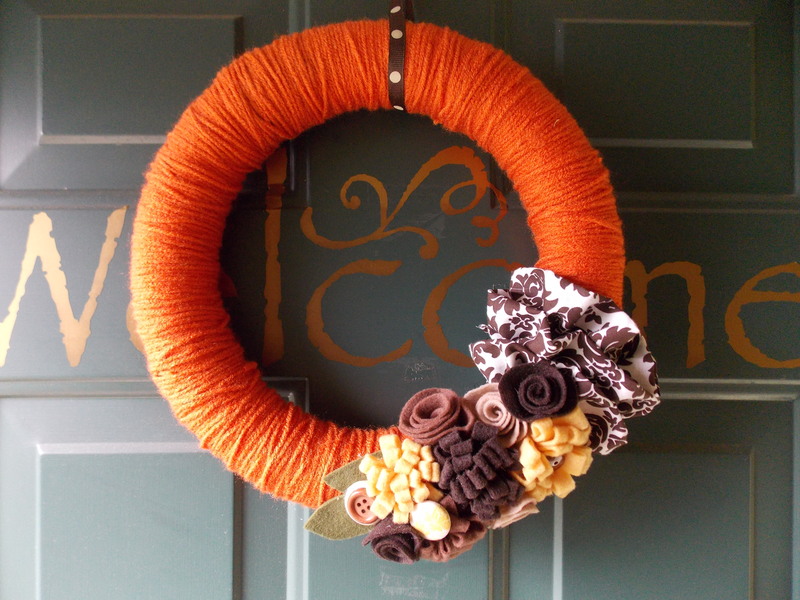 In fact, I just hung this little lovely on my front door once again to welcome September in. The kids are back in school–woo hoo!! It was definitely a weird type of week for me. Weird but good. This year ALL of my kiddos are in elementary school. We have a 5th grader, 4th grader, 2nd grader, and two that just started kindergarten. I am not used to having a quiet house, so it’s taking some getting used to. My little guys are in afternoon kindergarten, so I’m footloose and fancy free for a few hours every weekday now. It’s amazing how much I can get done without any little ones around! 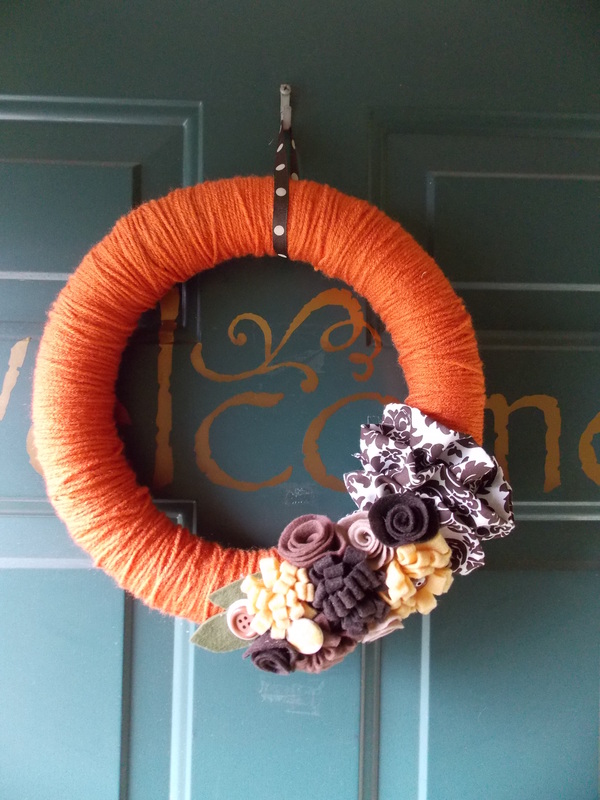 One of the many little projects I tackled this week was this yarn-wrapped fall wreath. 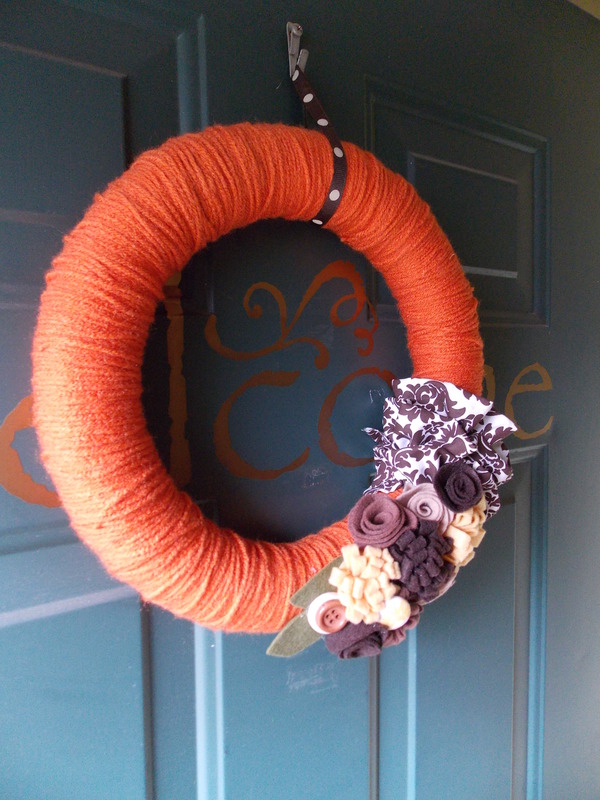 I haven’t made a wreath in awhile, so I wanted something fall-ish to spruce up my front door. 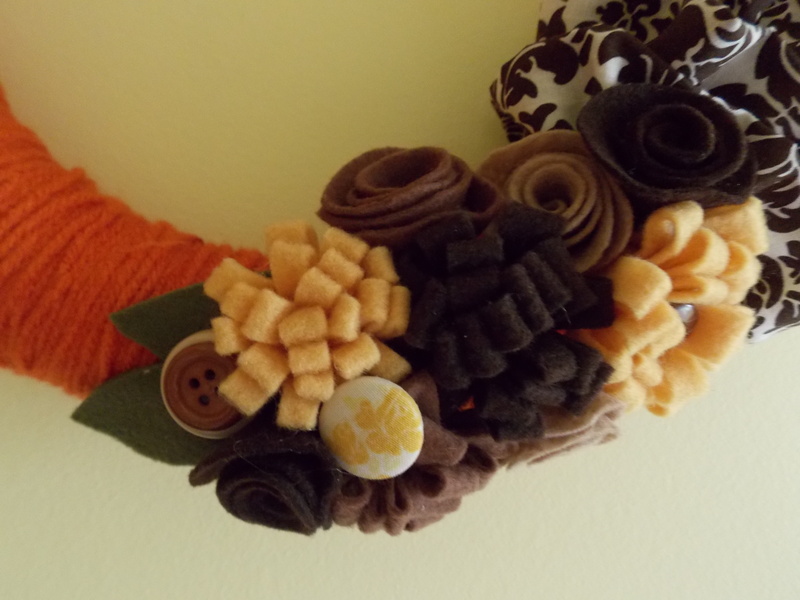 This orange yarn with fall colored accents are just the ticket. 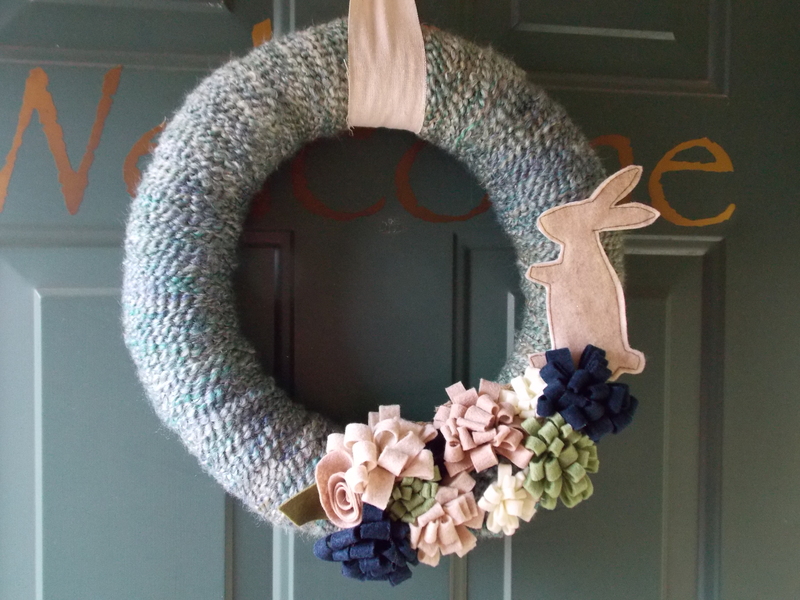 To make it, I simply wrapped a foam wreath form completely with yarn. I made a variety of felt roses, flowers, and green leaves that I thought would complement it. In addition, I also made some fabric covered buttons and regular buttons and glued those on as well. To add a finishing touch, I ruffled three pieces of this brown and white fabric and layered them at one end.